The Department of Obstetrics and Gynaecology at Queen's University established the Obstetrical and Gynaecological Memorial Fund in recognition of the fact that much of what we are, is due to the commitment and contributions of those who have gone before us. This fund which serves as a continuing memorial to our past faculty, annually provides encouragement and support for academic obstetrics and gynaecology at Queen's. Formally opened in October 1895, the Fenwick Operating Theatre cost $4,000 to build. Dr. Kenneth N. Fenwick, a Queen's Medical College professor and attending physician for the hospital had been requesting a new operating theatre for years and donated $2,500 of the cost. The theatre featured ten windows around the upper-perimeter and, most prominently, a large skylight in the domed ceiling. This contributed to a better-lit operating room before the installation of electric lights. A large gaslight also hung over the operating table to provide supplementary lighting when required. The theatre housed three rows of seats that accommodated up to 100 medical students. The discovery that sanitation and antisepsis were critical to the maintenance of health made Dr. Fenwick a great proponent of cleanliness in the operating room. The building's inner circular shape was intended to facilitate cleaning, as there were no corners in which dirt might get trapped. The floor was made of slate and the walls of polished white Italian marble, since slate and marble are less porous and more easily sanitized than wood. The Fenwick Operating Theatre was furnished with state-of-the-art equipment for the time: a new Endibohl's operating table with a Morris extension, two wash basins, three glass tables, and a boiler for sterilizing instruments. For more information, visit the Museum of Health Care online or download the new App: "Transformation of the Kingston General Hospital 1835-1914." JOHN LITCHFIELD, born in London England in 1808, was the son of John Charles Litchfield, a none-to-well-off surgeon practising in the Haymarket. As a result his sons did not complete their education and had to make their way in life as occasion offered. In his twenties John Litchfield became a free-lance writer and enjoyed some success as a journalist. His publications appeared in the Monthly Chronicle, the New Monthly Magazine and in Bentley's Miscellany edited by Charles Dickens. Prior to the Medical Council of Great Britain, established by the Medical Act of 1858, it was common practice for practitioners in London to offer lecture courses to assist the unregulated studies of medical students. Unqualified lecturers were common. John Litchfield claimed to have given lectures on diseases of the skin and to have served as a physician in the Infirmary for the Diseases of the Skin. However, these activities have never been confirmed. At the age of 30, Litchfield and his family emigrated to Adelaide, South Australia in 1839, where they lived for the next two years. He had modest success as a journalist but came to grief because of his efforts to pose as a physician. He established himself as a consulting physician in Adelaide and was appointed by the governor as inspector of hospitals for the province. Initially he was successful in the latter role addressing a number of public health issues and was actively involved in the building of a new hospital in Adelaide. His next venture was to establish a private asylum for treatment of the insane. However, the Governor could not confirm Litchfield's claim to have a diploma from Heidelberg and being financially over extended, Litchfield ended up in debtors' prison. He returned to England in 1841 and was a correspondent on the continent for a number of London publications for the next five years. There is some evidence that as a keen young journalist with an interest in medicine, he attended lectures on diseases of the skin at the Hospital St. Louis in Paris. In 1845 he was appointed medical superintendent at the Walton Lunatic Asylum near Liverpool and remained there for eight years. There, he likely learned what little there was then to know about psychiatry and the administration of asylums. Litchfield emigrated to the United States in 1853 at the age of 45 where again he took up his literary career, initially as editor of the International journal in Boston and subsequently as editor of the Montreal Weekly Pilot writing several articles on public health topics. Because of his literary and cultural interests, he established many contacts in Montreal. Litchfield applied for and was appointed superintendent of the Asylum for the Criminally Insane at Rockwood in Kingston in 1855. This appointment was obtained likely because of his experience in Walton asylum in England and unconfirmed testimonials from practitioners in United States and England. Litchfield continued in this position until his death in 1868. The inspector of asylums, reporting in the British American Journal in 1860 and again in 1862, commanded Litchfield for the admirable manner in which he managed the insane division of the provincial penitentiary. Litchfield's association with the medical department at Queen's began in 1855 when he was appointed professor of forensic and state medicine. In the next session, when the lecturer in midwifery left Kingston, Litchfield volunteered to teach the course and thus became the professor of midwifery. However, as the medical school became more established and wanted other provinces and United Kingdom schools to recognize its degrees, those who held professorships had to be academically above reproach. Litchfield's lack of medical qualifications came to light. In June 1857, Litchfield submitted a memorandum to the trustees of the university confirming that he did not practice midwifery and had never attended a confinement. But he requested he be granted an honorary degree in recognition of the lectures given. This request was not considered. As university policies were developed, Litchfield submitted his resignation as professor of midwifery. But in 1862 Litchfield was examined by his faculty colleagues and was granted a Queen's MD. He continued as professor of forensic and state medicine and the institutes of medicine (physiology) until his retirement in 1866 when he became an accepted member of the Queen's academic scene and one of the students' favourite professors. Litchfield was remembered as a kind gentleman who took an active interest in church and cultural affairs. He died December 18, 1868 at the age of 60 following a lingering illness. Litchfield and his wife Louisa had one daughter who married Dunbar Browne of Kingston. MICHAEL LAVELL was borne December 29, 1825, in Quebec City. Soon thereafter his family moved to Toronto. Two older brothers became ministers of the Methodist Church and Michael was a staunch member of the church. For a number of years, he worked in the office of the Christian Guardian under the well known Methodist minister and educator, Rev. Dr Ryerson. He was also superintendent of the Sunday school at the Adelaide St. Church in Toronto. Lavell received his medical education in Toronto, graduating in 1853 at the age of 27. Following a brief visit to Philadelphia, he established a general practice in Peterborough. He moved five years later to Kingston where he specialized in midwifery and the diseases of women and children. His ability and congenial personality quickly came to the attention of his medical colleagues. Dr Lavell, characteristic of the nineteenth century physicians, played an active role in the community. He continued his activities in the Methodist Church serving as superintendent of the Sunday school in the Sydenham St. Church and subsequently as recording steward at the Queen St. Church, and for 30 years was the local representative to the annual general conferences of the Methodist Church. In 1861, Dr Lavell seconded the nomination of John A. Macdonald as candidate for the conservative party earning him the title "second bottle holder for John A." from his less reverent colleague, Dr Stewart. But, astute politicians recognized how physicians were highly regarded in the community and Dr Lavell, remaining a loyal supporter of John A. Macdonald, benefited from the patronage which was characteristic of the politics of the day. On the advice of John A. Macdonald, minister of militia, Lavell was appointed surgeon for the 1st Battalion Frontenac Militia, a valuable entre for a young physician aspiring to the upper classes of the Kingston community. Subsequently Dr Lavell requested and received through John A. Macdonald an appointment as surgeon for the Kingston Penitentiary at an annual salary of $1200 in 1872. Dr Lavell's association with Queen's began in 1860 at age 34. The board of trustees, recognizing Dr Lavell's ability, appointed him as professor of midwifery and the diseases of women and children, and the following year he was appointed surgeon at the General Hospital. Dr Lavell's fortunes progressed until he was recognized as Kingston's leading obstetrician, gynaecologist, and paediatrician. He was a member of the Ontario Medical Council from 1866 to 1885, serving as a medical examiner in 1873-74 and as president of the council in 1874. Dr Lavell played an important role in medical affairs. When the university closed the medical department, he was one of eight founding incorporators of the Royal College of Physicians and Surgeons, Kingston, established August 15, 1866. He served as registrar of the college. In this role, Dr Lavell was a champion of medical coeducation at the Royal College and Queen's. His efforts to provide medical education for women is documented in correspondence with a 'Miss Smith' in 1879. Women were not permitted to take classes with the men but the faculty would not provide two series of classes. The compromise was a summer program beginning in 1880 when the classrooms were available and the hospital wards were free for teaching. Subsequently Kingston's Women's Medical College was established in June 1883 with Dr Lavell, the first president, dean and professor of obstetrics. Dr Lavell resigned from Queen's, the Royal College of Physicians and Surgeons and the Kingston Women's Medical College in 1885 at the age of 59 when again benefiting from John A. Macdonald's patronage, he was appointed warden of Kingston Penitentiary at the handsome annual salary of $2600. He continued in this post until his retirement in 1894. I am of the opinion that ‘Riel' although holding foolish and peculiar views concerning visions as to prophecy and General Government is an accountable being and knows right from wrong. Dr Lavell retired from professional life in 1894, at age 69, full of honour and deeply respected by colleagues, students and patients. The Queen's journal in February 1899 reported that students in final year had the pleasure of listening to two clear and interesting lectures from Dr Lavell at the request of Dr Garrett. Dr Lavell lived for a time with a son in Toronto but returned to Kingston in 1901 where he died February 18, at the age of 75. Dr Lavell married a Miss Reeve of Toronto in 1853, and together they had twelve children - ten sons and two daughters. This extensive family included two physicians, two judges, a dean of education at Queen's, and a minister who gained fame for inventing Queen's famous Gaelic yell. KENNETH FENWICK was born in Kingston April 12, 1852, the son of Reverend K.M. Fenwick and his wife Anne who had emigrated from Scotland in 1845. He received his primary education at the Kingston Private Academy and subsequently earned his BA at Queen's in 1871. He entered the Royal Medical College earning his MD degree in 1874 at the age of 22. He was appointed a house surgeon at the Kingston General Hospital and served as president of the Aesculapian Society during his final undergraduate year. Fenwick did postgraduate training at St. Thomas' Hospital, London, England as a surgical dresser. While in England he wrote the MRCS (Eng) examinations and visited a number of other hospitals before returning to Kingston. Dr Fenwick initially worked in partnership with Dr Yates but after three years he took over the practice of his grandfather, Dr Sampson. Dr Fenwick's association with the Royal Medical College began in 1670 with his appointment as a demonstrator in anatomy. He was appointed professor of medical jurisprudence in 1877 and subsequently professor of physiology and bacteriology (Institutes of Medicine) in 1881. He was appointed professor of obstetrics and gynaecology in 1885, at the age of 33. Dr Fenwick was an excellent teacher. He had the ability of conveying knowledge to others in a systematic, intelligent manner. His lectures were clear and concise. He was popular, respected and trusted by students. He was a committed advocate of continuing education. In 1885 he went to New York to attend a postgraduate course and to visit Roosevelt Hospital where he saw the new operating room theatres. He also was introduced to the benefits of antiseptic techniques in the treatment of wounds and the value of trained nurses. His experiences had an important impact on health care in Kingston. He introduced the antiseptic system in the management of his patients and was a vigorous advocate of this principle. He also wrote to the board of the hospital urging for the establishment of a training school for nurses at the hospital. The board agreed and in November 1885 advertised for applications for two young women to be trained as nurses at the Kingston General Hospital. The editor of the British Whig published a letter from Dr Fenwick in May 1886 outlining the proposal for the training school and the advantages of this vocation for women. This letter from a respected physician contributed to the changing attitudes toward nursing. Fifteen applications followed and there was never again a shortage. Dr Fenwick travelled overseas in 1890 visiting hospitals in London, Edinburgh, Berlin, Hamburg and Vienna. In 1893 he went to the United States to visit hospitals in Chicago, Detroit, Philadelphia, where he met Dr Joseph Price, and to Baltimore where he met Dr William Osler and Dr Howard Kelly at the new Johns Hopkins Hospital. Significant developments again resulted. Obstetric and gynaecologic patients were increasing at the Kingston General Hospital and in 1892. Dr Fenwick restricted his clinical activities to this specially. A separate building was proposed for obstetrics and gynaecology and $20,000 of the Doran estate bequest was committed for a women's and children's hospital. The Doran Wing, formally opened in February, 1894 was described as a model women's hospital with separate wards for maternity, gynaecology and isolation plus its own operating room. Dr Fenwick also proposed a new operating amphitheatre for the hospital and to this end donated $2,500 to the hospital. The two-story stone building housing a surgical amphitheatre and seating for one hundred students was added to the back of the main hospital building. It was opened formally in November of 1895 and was known as the Fenwick operating theatre. I have no patience with the man who thinks he is perfect, that he knows it all. Let each one of us therefore aim to add something to the sum total of medical knowledge. While draining an abscess of a child Dr Fenwick sustained a small cut on a finger. This apparently innocuous injury became infected, then gangrenous and he died of septacemia January 21, 1896 at the age of 43. His contribution to the university, the hospital and the community was expressed in the many memorials written at the time of his death. Dr Fenwick's family life was marked by misfortune. He and his first wife (a Miss Sterling) had a daughter and a son before her death. Five years later he married a Miss Hamilton who gave birth to a second daughter only to die within the next year. In June 1894 he married Miss MacPherson of Ottawa. RICHARD GARRETT was born in 1853. His initial undergraduate degree was an MA from Trinity University, Toronto. He subsequently entered the Faculty of Medicine at Queen's. In keeping with the practice at that time he was one of two medical students who in their final year were appointed as interns at the Kingston General Hospital. He received his MD degree in 1882 at the age of 29. Following graduation he entered practice as an assistant to Dr Sullivan, the professor of surgery. He soon came to be recognized for his clinical and surgical skills. His career at Queen's began in 1883 when he was appointed as a demonstrator in anatomy. He was appointed professor of anatomy in 1888 at the age of 35 and continued in this position for the next five years. Dr Garrett was appointed as an attending physician at the Kingston General Hospital in 1893. His teaching responsibilities shifted from the basic sciences to clinical medicine with his appointment as a professor of clinical surgery in 1894. In 1896 at the age of 43 Dr Garrett was appointed professor of obstetrics and gynaecology. With the increasing numbers of patients coming to the women's hospital, Dr Garrett was joined by Dr Isaac Wood who served as an assistant in obstetrics and gynaecology and paediatrics at Queen's and Kingston General Hospital. By the end of the l0th century the value of continuing education was recognized and Dr Garrett travelled to England in 1899 to spend six weeks visiting a number of hospitals. He had pride in his discipline and in convocation hall, March 1901, in a lecture addressing the progress of the nineteenth century and the prospects for the twentieth he stated that 'Obstetrics had been rescued from the hands of ignorant midwives and with its allied branch gynaecology has been raised to its legitimate position as a science.' A highlight of Dr Garrett's teaching and clinical career was the publication of a Textbook of Medical and Surgical Gynaecology. This 420 page text served as a guide for students and a reference for general practitioners and was described by a reviewer as a concise work well indexed, with systematically arranged printing and illustrations. Due to ill health Dr Garrett retired in 1913 at the age of 60 and died January 21, 1925 at the age of 72. He had two sons, William and Reginald, and one daughter. ISAAC WOOD, born in Augusta, Grenville County in 1853 obtained his education at Albert College in Belleville and later attended Ottawa Normal School. Following graduation he taught at Prescott High School and Kingston Model School. Following a short teaching career he came to Queen's and graduated with a BA in 1884. He worked at the Commercial School of Business in Kingston but soon returned to Queen's where he earned an MA in 1891 and his MD degree in 1892 at the age of 39. He went to England for post graduate training and earned the MRCS (Eng) degree. Returning to Kingston, Dr Wood established his practice in 1893 and in 1894 was appointed lecturer in medical chemistry. In 1896 he was appointed assistant professor in obstetrics and gynaecology, lecturer in paediatrics and continued as a lecturer in chemistry and applied chemistry. Paediatrics, traditionally practised with obstetrics and gynaecology, was recognized as a separate subject in 1904. Dr Wood was appointed professor of paediatrics while continuing with his other academic responsibilities. Dr Wood died quite suddenly on September 1, 1910 at the age of 63. Following his death Dr Condell described Dr Wood as a chemist of unusual ability, a general practitioner with few equals, an obstetrician in constant demand and a surgeon who had earned the confidence of the profession in Kingston and southeastern Ontario. Dr Wood and his wife had one daughter, Olivia. GORDON MYLKS, born in 1876, grew up on a farm in Augusta Township. He attended Brockville Collegiate and subsequently entered the Faculty of Medicine at Queen's. He earned his MD degree in 1897 at the age of 21, graduating as gold medalist in his class. After working as an intern at the Kingston General Hospital he established a flourishing general practice in Kingston in 1898. He restricted his practice to surgery, gynaecology and obstetrics in 1920. Dr Mylks' association with the Faculty of Medicine at Queen's began with his appointment as a demonstrator in pathology and bacteriology in 1900. He moved to the Anatomy Department in 1901 as a demonstrator and as an assistant professor in 1904. He was professor of anatomy, 1905 - 1907, (until the appointment of Dr Hetherington) and then became an assistant professor of applied anatomy, an appointment which continued until 1911. Dr Mylk's teaching responsibilities in the clinical departments began in 1906 with his appointment as an assistant professor in surgery, an appointment which continued until 1911. In 1907, Dr Milks spent the summer in general clinical work in London, England. He returned to London in 1911 for further experience in obstetrics and gynaecology. Dr Mylks' long association with obstetrics and gynaecology began in 1911 at the age of 35. He was appointed associate professor in obstetrics and gynaecology, and professor of paediatrics and was responsible for instruction of those subjects. His responsibility for paediatrics continued until 1917 when paediatrics became an independent department with its own professor. Following the pattern of a few centres in North America, obstetrics and gynaecology were considered separate subjects. Dr Williamson was appointed professor of obstetrics in 1914 with Dr Mylks as professor of gynaecology. The first clinical assistant in gynaecology, Dr Morison, was appointed in 1924. Dr Mylks assumed Dr Williamson's teaching load in 1928. It was recommended that he continue to teach both subjects and supervise the combined department. In 1929, at the age of 52, he was appointed professor of obstetrics and gynaecology with six clinical assistants in the combined department. He continued this responsibility for the next eleven years until his retirement in 1940 at the age of 63. On his retirement, the Principal's report noted that Dr Mylks had won the respect of successive generations of students. Dr W.T. Connell cited his long and distinguished record as a physician in the city of Kingston. In 1948, the Kingston and Frontenac Medical Association held a dinner honouring the 50th anniversary of Dr Mylks' practice and Dr Etherington remarked that 'no one has made a greater contribution to the medical life of this city'. Dr Mylks retired from practice in 1953 at the age of 77 and died while on a holiday in Florida, February 13, 1957, at the age of 81. Dr Mylks was married to Lucy Row and subsequently to May Haydon of Kingston. They had two sons, Cordon and Henry, and one daughter, Helen. ARCHIBALD WILLIAMSON, borne in Kingston in 1875 was educated in Kingston schools, and earned a Queen's BA as gold medalist in 1895. In 1896 he earned his MA. He entered the Faculty of Medicine at Queen's and in 1899 at the age of 24 graduated with his MD degree, again as gold medalist of his class. He spent the next year as an intern at the Kingston General Hospital and in 1900 he went to England for six months completing examinations earning the degree MRCS (Eng). In correspondence Dr Williamson outlined the demanding character of these examinations and noted the value of his internship in meeting this challenge. Dr Williamson returned to Kingston in 1901 and started a practice which quickly flourished. In 1909, at the age of 34 he was appointed medical officer of health by the City of Kingston. He continued as a skilled practitioner and Medical Officer for the city until his death. Dr William's association with Queen's Faculty of Medicine began in 1901 with his appointment as a demonstrator in pathology and bacteriology. He continued in this role for the next 15 years. In 1904 his responsibilities in the faculty increased with his appointment first as lecturer and later as professor of medical jurisprudence, a responsibility he held for 11 years. Dr Williamson was acknowledged to be an indefatigable worker and in 1908 his responsibilities increased once again with his appointment as faculty secretary and librarian. For two years he served also as a lecturer in chemistry and applied chemistry. Dr Williamson was recognized as a diligent knowledgeable academic. He was appointed professor of obstetrics in 1914 at the age of 39 while Dr Mylks continued to be responsible for gynaecology. His course in obstetrics included four lectures each week with practical instruction on the maternity wards. After a brief illness in the fall of 1928, he died at the age of 53. Dr Etherington described him as an admirable teacher and a truly good man. Dr Williamson and his wife Norma had two daughters, Nora and Elsie, and one son, Arthur. PRESLEY MCLEOD, the son of Winnifred and James McLeod was born in Kingston 15th of October, 1900. Following primary and secondary education in Kingston schools he entered Queen's University in 1917 earning a BA in 1921. He graduated from the Faculty of Medicine in 1926. He had an illustrious undergraduate career playing 'flying wing' on four tricolour championship teams, three of which won Dominion football championships between 1922 and 1924. While in the Faculty of Medicine, he served as president of the Aesculapian Society for 1925-26. 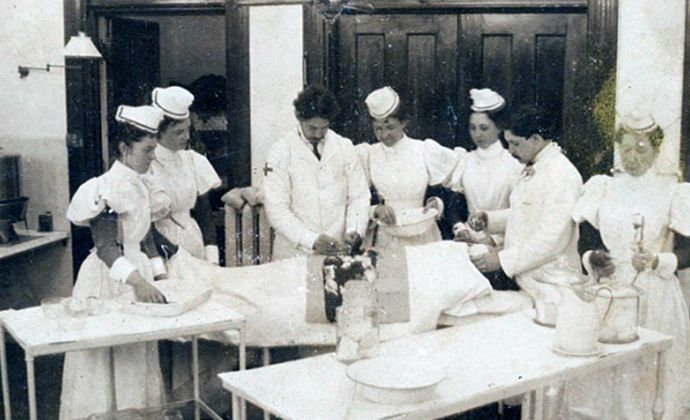 Postgraduate study included a surgical internship at the Royal Victoria Hospital, Montreal 1926-27 followed by a residency in obstetrics and gynaecology at the Women's Hospital New York, 1927-1929. In 1935 Dr McLeod was the first faculty member to earn a higher degree in obstetrics and gynaecology when he successfully completed the examinations for membership in the Royal College of Obstetricians and Gynaecologists in London, England. He returned to establish his practice in obstetrics and gynaecology in Kingston in 1929 and in the same year was appointed clinical assistant in obstetrics and gynaecology at Queen's. He was promoted to assistant professor in obstetrics and gynaecology in 1933. The same year he was ap pointed as Frontenac County coroner, a responsibility he continued until his retirement in 1968. Dr McLeod served during the second world war as Lt. Col. in command of No. 1 Field Ambulance Corp based in Vancouver and as a medical advisor to the department of national war services between 1941-1944. Dr McLeod returned from his wartime service leave of absence in 1944. He was granted a fellowship in the Royal College of Surgeons of Canada in 1945 and elected a Fellow of the Royal College of Obstetricians and Gynaecologists in 1947. That same year he was promoted to associate professor in obstetrics and gynaecology. For the next twenty years he provided excellent patient care and responsible undergraduate and graduate teaching until his retirement in 1968. Dr McLeod was active in obstetrics and gynaecology outside Queen's. He was a member of the Canadian Gynaecological Travel Society serving as its president in 1940. He served as president of the Eastern Ontario Society of Obstetricians and Gynaecologists in 1949, and was a charter member of the Society of Obstetricians and Gynaecologists of Canada. He was perceived as a modest, self-effacing man and a master at bridge. Presley and his wife Dorothy had three daughters, Margaret, Jane and Pat. GORDON MYLKS, born June 15, 1904, was raised in Kingston. Though he was quite interested in music while earning his BA at Queen's, he decided upon medicine and received his MD degree in 1929, at the age of 25. He completed a rotating internship at Englewood Hospital, New Jersey and later did a residency at the French Hospital in New York from 1930-33. Though his first goal was surgery his interest in obstetrics and gynaecology was identified while in New York and he continued his training in that discipline. His training was completed in Britain as he visited a number of hospitals including the Royal Infirmary, Edinburgh and the Rotunda Hospital in Dublin. He returned to Kingston to establish his practice and was appointed clinical assistant in obstetrics and gynaecology at Queen's in 1936 at the age of 32. He was promoted to lecturer in 1940 and assistant professor in 1944. The same year he was certified by examination, a diplomats of the American Board of Obstetrics and Gynaecology. He became an associate professor in obstetrics and gynaecology in 1954. Dr Mylks was appointed joint chief of obstetrics and gynaecology at the Hotel Dieu Hospital, a responsibility which continued until 1967. Dr Mylks was active in organized medicine. He served as President of the Kingston Academy of Medicine. His role in the Ontario Medical Association began in 1957 as chairman of the obstetrics and gynaecology section. He was elected to the O.M.A's board of directors in 1960, later serving as chairman of the board 1963, vice-president in 1964 and president 1965-66. Dr Mylks donated a well known clock which hangs in the office of the President with the inscription 'A time to keep silence and a time to speak' . Dr Mylks retired from the department in 1968 at the age of 64. But he continued to serve the Kingston community. He had been president of the Kingston Kinsman's Club in 1936 and president of the Kingston Branch of the Alumni Association of Queen's University in 1948-49. He was active in the Masonic Lodge, and an elder at Chalmer's United Church where he had been a longstanding member of the choir. Subsequent to his retirement from Queen's, he was appointed chairman of the board of directors of the Family Counselling Service established by the Social Planning Council of Kingston. In November 1971, Queen's Alumni, held a dinner for Dr Mylks where he was presented with the Kingston award ‘for meritorious service to Queen's and to the community. Dr Mylks collapsed while curling and died February 23, 1973, at the age of 68; as noted by his OMA colleagues, an appropriate completion of a most useful and happy life. Gordon and his wife, Clara, had two daughters, Nancy and Barbara and one son, Gordon. Edinburgh and graduated in 1926. His graduate training in obstetrics and gynaecology included house surgeon appointments in gynaecology and obstetrics at Leith Hospital, the Royal Infirmary and the Royal Maternity and Simpson Memorial Hospital in Edinburgh. His research training included six months at the University of Lausanne and a concurrent appointment in the department of animal genetics, University of Edinburgh from 1929. In 1931 he was admitted by examination to Fellowship of the Royal College of Surgeons. He named, by examination, membership in the Royal College of Obstetricians and Gynaecologists in 1933 and subsequently was granted fellowship in the Royal College in 1940. He served as a consultant in obstetrics and gynaecology at several hospitals including the Edinburgh Corporation Antenatal Clinic at Portabello, Leith Hospital, the Royal Infirmary, Western General Hospital and the Hospital for the Diseases for Women. At the same time he was lecturer in clinical obstetrics and assistant to the professor of midwifery and diseases of women at the University of Edinburgh. He was appointed as the first full-time chairman of obstetrics and gynaecology at Queen's in 1939, a position he held for the next 25 years. He brought with him an excellent reputation as a teacher, clinician and researcher and his subsequent career was marked by significant achievements. Dr Robertson initiated and maintained the first long term externally funded research program in the department. These studies began in 1947 and continued for the next 15 years. The laboratory component included investigation of microscopic and electron microscopic characteristics of the human cervix while clinically the role of the colposcope and colpomicroscope in the detection of precancerous and cancerous lesions of the cervix was assessed. Latterly, normal and abnormal placental tissue was investigated in collaboration with the department of pathology. Dr Robertson's abilities were recognized outside Queen's. He took a leave of absence for six months in 1950 exchanging positions with Dr J. Chassor Moir, Nuffield Professor of Obstetrics and Gynaecology, Oxford, England: Dr Robertson assumed responsibility of that prestigious department while Dr Moir came to Queen's. He served as the Ontario chairman for District V of the American Academy of Obstetrics and Gynaecology in 1956 and president of the Canadian Society for the Study of Fertility. Dr Robertson retired from the Faculty of Medicine and the department in 1968 at the age of 66. He lived in Kingston until his death in 1977. Dr Robertson and his wife Hannah had three children, one son, William, and two daughters, Gillian and Elspeth. Dr. Low came to Kingston in 1965 to assume the position of Professor and Head of Obstetrics & Gynaecology, Queen’s University and the Chief of Service at the Kingston General Hospital. During the twenty years as Head, he was instrumental in shaping the Queen’s Department of Obstetrics & Gynaecology into one of the most respected academic clinical departments and one of the most sought after postgraduate residency programs in the country. Furthermore, during his tenure as the Head, the department became recognized for academic excellence at the national and international levels in the areas of maternal-fetal medicine, urogynecology and gynecologic oncology. It was through the philosophy and ideals of Dr. Low that the department continues to flourish and remains to this day one of the country’s more successful academic departments of obstetrics and gynaecology. 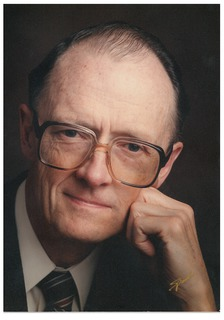 At various times during his career, Dr. Low served as Secretary/Treasurer, Vice President and President of the Association of Professors of Obstetrics and Gynaecology of Canada (APOG), Chair of the Specialty Committee for Obstetrics & Gynecology and Chair of the Manpower Committee for the Royal College of Physicians and Surgeons of Canada, Chair of the Postgraduate Manpower Committee of the Council of Ontario Faculties of Medicine, Chair of the Perinatal Medicine Committee for the Society of Obstetricians and Gynaecologists of Canada (SOGC) and member of the Editorial Board for the two most prestigious journals in our specialty; Obstetrics & Gynecology and the American Journal of Obstetrics & Gynecology. From his first peer-reviewed publication in 1959 to finishing his last manuscript the week before he died, Dr. Low has had one of the most influential and productive careers as an academic obstetrician and gynecologist in Canada. He is recognized as a world-renowned expert in the fields of fetal asphyxia, cerebral palsy and female urinary incontinence. With all of these achievements, Dr. Low always identified that his successes have been a part of his role with the Department at Queen’s and has always promoted recognition of this university. Following his retirement from clinical practice in the early 1990s, he embarked on a second career when he established and had been leading and promoting the Museum of Health Care at Kingston until shortly before his passing. Dr. Low has received many awards during his lengthy career including being named a Fellow of the Royal College of Obstetricians and Gynaecologists (United Kingdom), Queen’s University Distinguished Service Award, Kingston First Capital Honourable Achievement Award, Queen Elizabeth Diamond Jubilee Medal and this year, just prior to his death, Dr. Low was invested into the Order of Canada, specifically for his work with the Museum of Health Care.